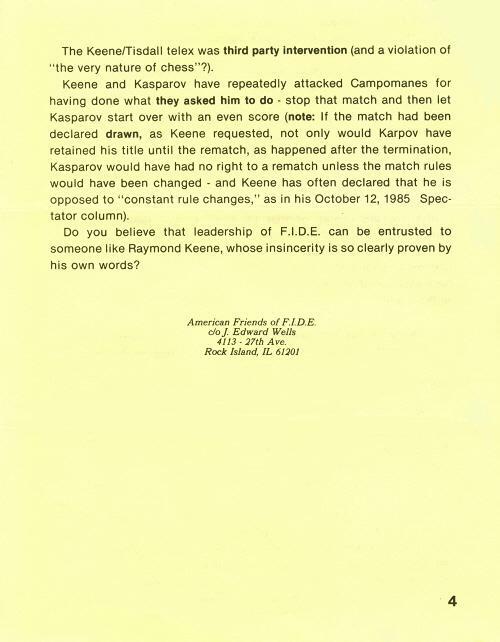 There seems to be a distinct move away from how the termination decision was interpreted at the time; in 1985 it was widely condemned as Campomanes’ response to panic-stricken pleas that he save the title of his worn-out friend Karpov. That was the message in Kasparov’s fulminations against Campomanes, Karpov, Sevastianov, Gligorić, Kinzel, etc. in a series of press conferences and interviews. Journalists believed him and were unreceptive to other points of view. Now, some three years after ‘The Day of Shame’, as Kasparov terms it, Child of Change provides an opportunity to analyse the affair more soberly. In investigating the reliability of the claims made by Kasparov and his supporters, we may reduce the issues to five basic questions. 1) Was Karpov exhausted towards the end of the match? 2) Was Kasparov in good physical and mental shape at the end of the match? 3) In what circumstances did Campomanes return to Moscow shortly before terminating the match? In studying this question, Kasparov’s words on page 125 of his book should be borne in mind: ‘The final truth about this match, I believe, is as Grandmaster Keene reported it.’ Kasparov and Keene are close friends who have collaborated on literary and political projects; Keene’s writings are frequently quoted with approval in Child of Change. ‘To bail him out’ was not part of the message, but Keene’s (slanted) way of interpreting it. Raymond Keene himself (see May 1986 BCM, page 206) no longer defends his quoted words from The Spectator; nor has he retracted them. 4) Was Kasparov disadvantaged by the termination decision? In fact, Kasparov stated (see page 141 of Child of Change) that his chances of winning the match were ‘about 25 or 30%’. It is not clear how Keene interprets 25 or 30% chances as meaning ‘on the verge of victory’. 5) Was the termination decision defensible as a matter of principle? So the argument now is that what was wrong was Campomanes’ timing, not the principle of termination (or ‘outside intervention from a third party’). Raymond Keene offers a compromised [sic] solution to end the current problems in Moscow. In view of the current difficulties and in respect to the splendid fighting spirit there has prevailed in the world championship, Raymond Keene proposes that the current match be declared drawn with the players sharing the world title. This tie can then be broken in a match of fixed duration to be held late in the year and offers [sic] to find sponsorship that will allow the return fixture to be held in London. If this solution is acceptable London Docklands Development Corporation would be delighted to act as host to this prestigious event. Raymond Keene has provided two contradictory claims as to when the telex was despatched. 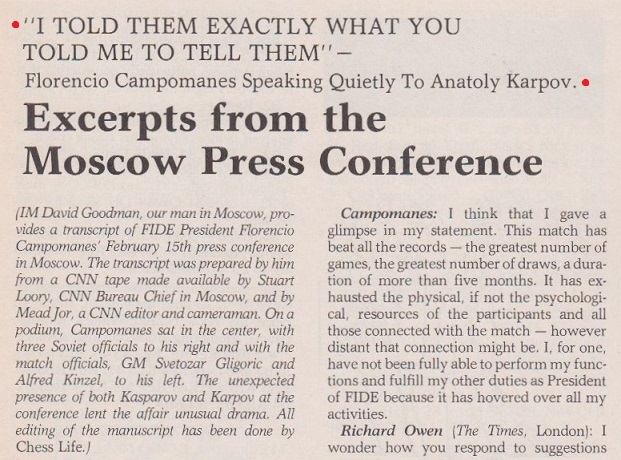 On page 139 of The Moscow Challenge he indicated that it was sent after the final announcement by Campomanes that Karpov ‘accepted’ the termination decision and Kasparov ‘would abide by it’. 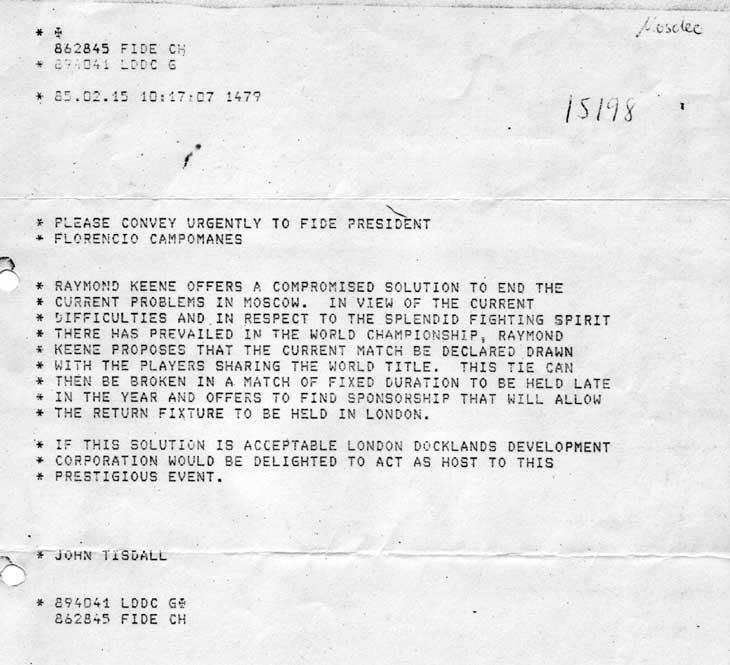 However, on page 411 of the September 1986 BCM he stated that the telex was sent in the morning, in reaction to an (inaccurate) announcement on the radio that the match had already been terminated. The obvious question here is: why were Kasparov and his trainers laughing? By providing exact page numbers for all quotes, my article permitted readers to make an independent check of the source material, and my only difficulty lay in selecting a small sample of inconsistencies and contradictions from the available heap. I pointed out many others in a very detailed (2,500 words) review of Child of Change in the September-October 1987 issue of Chess Notes, and nobody has disputed a single one of them. By means of a lengthy but largely irrelevant account of a conversation with Campomanes, Mr Keene skates over my list of five observations on his Spectator column. 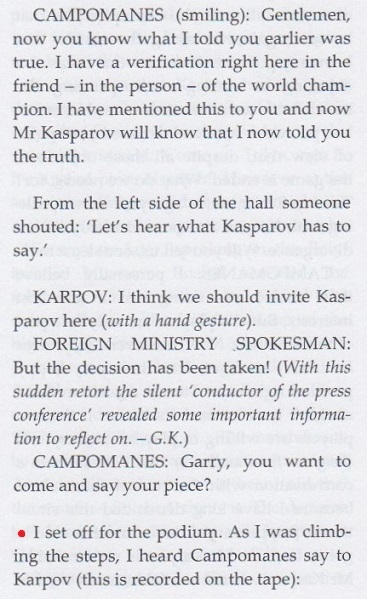 He still fails, for instance, to corroborate or withdraw his claim that the telephone message was ‘from Karpov’s camp’ or that Campomanes was told he ‘should fly at once to Moscow to bail him out’. That frenzied version of events has been contradicted by all parties, and the fact that Gligorić made the telephone call is now accepted even by Kasparov (see page 131 of Child of Change). Mr Keene summarily rejects the testimony of Donald Schultz (who, unlike him, was present in Dubai during the telephone call) on the grounds that he has ‘found him on the key issues to be a faithful adherent to the FIDE line’. Such logic can easily be turned against Mr Keene: his virulent anti-FIDE stance automatically means that he is an unreliable witness on all matters concerning Campomanes. 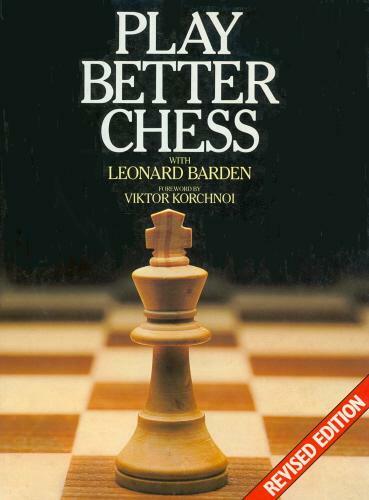 Indeed, his eagerness to ridicule the FIDE President has involved him over the years in many errors, such as his over-hasty conclusion that Kasparov was forced to take a time-out on 11 February 1985, whereas Kasparov himself has stated (Child of Change, page 131) that it was his own free decision. Nobody who reads page 21 of Manoeuvres in Moscow will take seriously Mr Keene’s explanation of his remark about ‘had Campomanes kept silent ...’ There is no indication whatsoever in the text that he disagreed with the view that subsequent termination of the match would have merited ‘widespread approval’. His convoluted defence of the telex fails to deal with the clear-cut contradiction pointed out by my article (page 56): in the BCM he stated clearly that the telex was sent before the press conference started, but in The Moscow Challenge he stated equally clearly that it was sent after the press conference ended (which means more than 90 minutes (!) after Campomanes first took the floor). If that is not a contradiction then the word has no meaning. His letter contains further proof of his unreliability on matters of timing, for he suggests that the Tass report was anterior to the British radio announcement. Yet on page 411 of the September 1986 BCM the same Mr Keene stated the exact opposite, claiming that the Tass report came over an hour later. He also admitted there, contrary to the impression he gives above, that he himself did not actually hear the BBC’s (inaccurate) news report but was merely told about it by an unnamed third party. There is no secret as to how I acquired Mr Keene’s embarrassing telex. 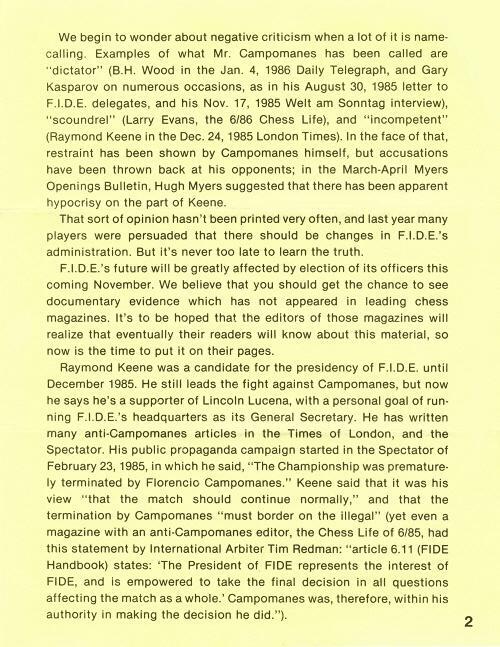 Having noted by Autumn 1985 that published references to it were inconsistent, I wrote an enquiry to the FIDE Headquarters. 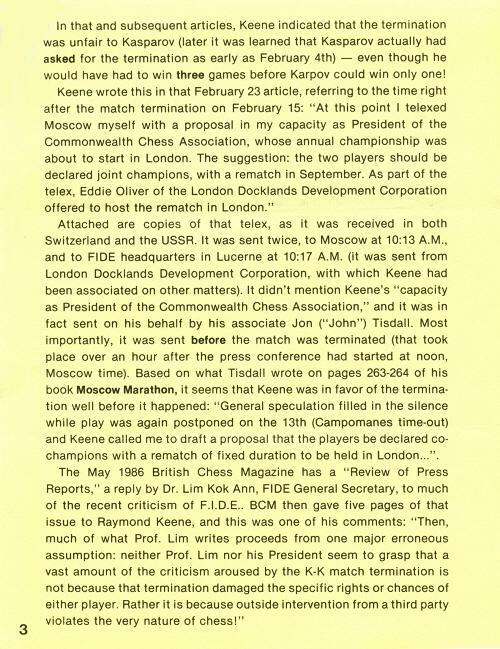 Incidentally, upon receiving a photocopy I was able to note a further untrue remark by Mr Keene: on page 139 of The Moscow Challenge he stated that his termination proposal in the telex was made ‘in my capacity as president of the Commonwealth Chess Association’. In fact, the CCA was not mentioned anywhere in the message. With Mr Keene things are rarely straightforward. His position would be consistent and comprehensible only if he had sent a telex to Campomanes arguing for the match to be continued. He did not do so. By referring to the ‘right to my own opinion’ Mr Keene indulges in an astounding piece of prevarication. This section of my article presented two incontrovertible facts: A) Kasparov stated that his winning chances were 25/30%, and B) in the Sunday Telegraph Mr Keene falsely wrote that Kasparov has claimed (in Child of Change) that he had been ‘on the verge of victory’. Mr Keene’s ‘right to my own opinion’ does not include the right to distort Kasparov’s position by putting that opinion into the world champion’s mouth. Passing over his curious speculation about Kasparov’s laughter, we come to his even more curious (and gratuitous) final paragraph. Given his track record of inaccuracy (the telephone call episode is just one example) Mr Keene is a poor advertisement for the profession of roving reporter. Moreover, his suggestion that I should refrain from analyzing the Termination as I was not present in Moscow at the time is breathtaking for the simple reason that he was not there either. Although both of us are without ‘first hand knowledge of the occurrences’, the difference between us is that Mr Keene rejects outright the testimony of virtually all personalities who were there (Campomanes, Karpov, Sevastianov, Gligorić, Kinzel, etc. ), just as his letter peremptorily dismisses Donald Schultz’s eye-witness report from Dubai. The independent writer who sifts the available documentation without fear or favour has a considerable advantage over Mr Keene, who has far too many vested interests. On the Termination issue, as on many others, he has regularly misused his journalistic position with The Times, The Spectator and B.T. Batsford Ltd. in furtherance of his political campaign to oust Campomanes. His weapons have been the very kind of ‘twisting or turning’ and ‘selective quotation’ which he unjustifiably attributes to me. Readers of Chess Notes have seen countless (unrefuted) examples. Mr Keene further distorts the truth by claiming I consider myself ‘a great expert’ on the Termination affair, whereas I have repeatedly stated in Chess Notes and elsewhere that I am a ‘Don’t Know’. I have never argued that the deficiencies of the Kasparov/Keene version automatically mean that Campomanes was right to stop the match. Unlike Mr Keene, I am convinced that much more research is required; the results of the subsequent Kasparov-Karpov matches are irrelevant to the issues of principle raised by Campomanes’s controversial decision. 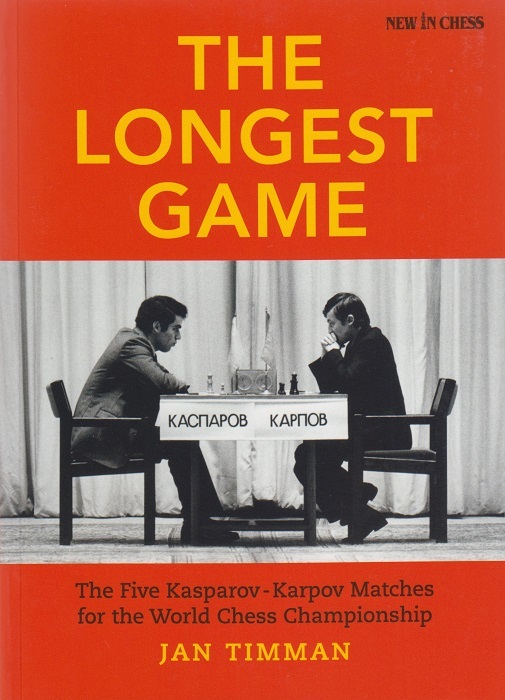 Taking into account the unprecedented duration of the world title match between A. Karpov and G. Kasparov, which is still in progress after more than five months, and in which 48 games have already been played (that is two full matches under the old rules), the USSR Chess Federation, expressing concern about the health of the participants, requests a three-month suspension of the match. As is known, there was envisaged in the agreement of the unlimited match Fischer-Karpov (1976 – sic) a break after four months’ play. This provision was included on the basis of advice of medical specialists. Yet the Karpov-Kasparov match, as already pointed out, has exceeded this length and is still in progress. We also point out that the proposal to have a break does not run contrary to the FIDE Constitution, nor to the match regulations, and, we feel, would be met with satisfaction by the public opinion of the chess world. Your positive decision would be helpful and in the interests of the development of chess creativity. Wood never corrected, or apologized for, his amazing litany of misinformation. 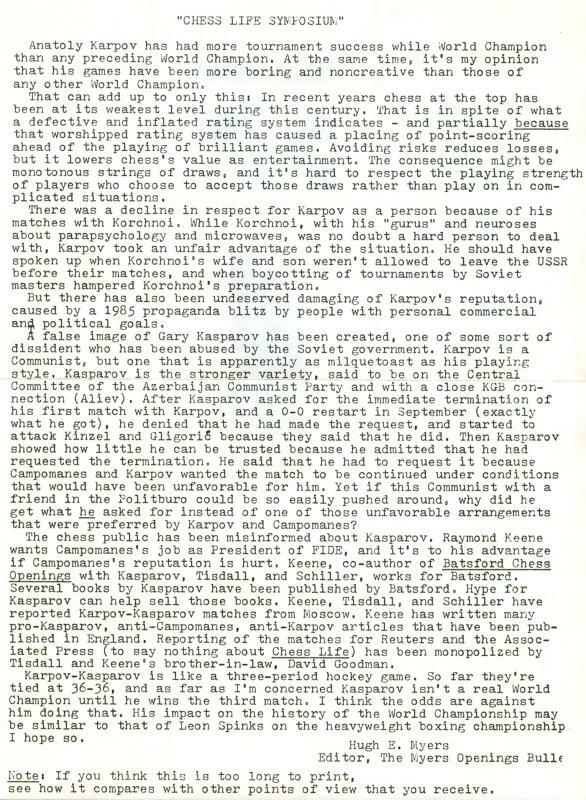 As noted on page 271 of Kings, Commoners and Knaves, Keene also wrote, in The Times of 27 February 1993, page 5, that ‘Kasparov revived and began to win game after game’, and there was more of the same on page 49 of Man v Machine by R. Keene and B. Jacobs with T. Buzan (Brighton, 1996); that book asserted that the 1984-85 match was stopped ‘just as Kasparov had started to win a series of games’. But should chess writers and researchers throw up their hands and admit defeat? Is there really no longer any chance of determining the truth? In whose interests would it be for matters to be left unresolved? Below is a follow-up item we wrote in June 2004 (C.N. 3328). The 20th anniversary of one of the most controversial happenings in chess history will come on 15 February 2005: the Termination of the first world championship match between Karpov and Kasparov. In C.N. 1990 (see CHESS, November 1993, page 50) we called it a topic ‘which chess literature (books and articles) has yet to settle authoritatively’, and it may be wondered whether any fresh details have emerged since then. Investigative journalism being virtually non-existent in the chess world, there is every reason for truth-seekers to fear (and for others to hope) that the 20th anniversary will come and go without new, accurate information being brought to light or old, inaccurate information being laid to rest. Kasparov, for his part, has stated (on page 127 of his book Child of Change) that ‘the full story may never be known’, although he has often set forth what he calls his ‘theories’. And what about Karpov? His book Karpov on Karpov (New York, 1991) had the subtitle ‘Memoirs of a chess world champion’, but the Termination Affair was (remarkably and, indeed, shockingly) ignored. Are none of those involved in the controversy willing and able to state now, plainly and factually, what they do and do not know, so that chess historians are offered at least a sporting chance of piecing together the truth? At one point we did receive from FIDE a Dictaphone cassette and transcript, but Campomanes’ answers (to only four questions) were so discursive and disjointed that turning them into a printable item was beyond our ability. We hope that, even now, an enterprising writer will be able to pull off the feat of obtaining from Campomanes his ‘definitive’ version of the events in Moscow. More generally, it would be most welcome to see a reliable journalistic write-up of the entire Termination Affair which is devoid of speculation. The matter is simply too important to be touched by the ‘I-think-I-read-somewhere’ and ‘My-guess-would-be’ brigade. Sorting out fact from fiction is a time-consuming task, not least because certain ‘chess writers’ more pro-Kasparov than pro-truth have repeatedly warped the facts of the case; for innumerable examples see pages 221-225 and 269-270 of Chess Explorations and pages 172-179 of Kings, Commoners and Knaves. At least for now, it seems unnecessary to cite any such instances here, but we may do so later on. A number of chess writers have handled the Termination decision inaccurately, and, above all, Keene has often attacked it with abject falsehoods. 2 in the extract you quote winter seems to be unable to reconcile the facts that i sent off a telex message in the morning while elsewhere i refer to my message reaching moscow later that day-what he has forgotten -presumably because he does not get out and about much-is that moscow is three hours later in time than the uk, so it was perfectly possible to send a telex in uk morning time, while at the same time it was much later in the afternoon in moscow! that rather obviously explains why it was possible for me to know about events happening in moscow in their afternoon time while it was still morning time in london. this is so blazingly obvious i have never bothered to point it out before. Mr Keene mentions only one specific matter, and it is untrue. We have never overlooked the obvious existence of a three-hour time-difference between the United Kingdom and Moscow. Indeed, we drew attention to it in C.N. 1222 at the time the Keene/Tisdall telex came to light: ‘the identical text was also sent direct to Moscow, at 10:13:52 GMT (Moscow time minus three)’. It is yet another example of his ineradicable mendacity. Nothing by Raymond Keene should be taken on trust, and especially about his critics, his cronies or himself. Whether pretending to know what he does not know or not to know what he does know, Raymond Keene oscillates between bluster and silence. Although he is guileful to the gills, the guile is fortunately transparent, and he fools fewer people with every fresh aberration. 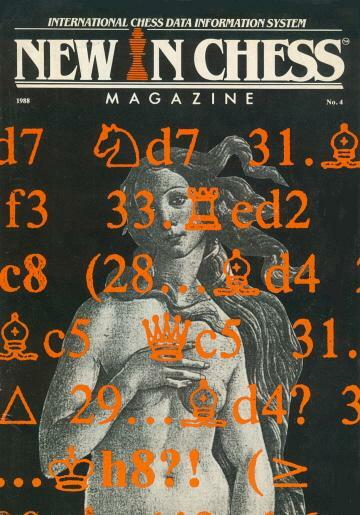 The item was published on pages 32-33 of the March 1986 Chess Life with a number of unauthorized editorial amendments. For the complete set of the ten FIDE Facts sheets, see our feature article The 1986 FIDE Presidential Election. Illustrated with 25 “plates” with rather babyish captions, Garry Kasparov’s New World Chess Champion has annotations to all 24 games of the second K-K match. There is a regrettably, but predictably, slanted Forward on the termination of the earlier contest. Can he really be unaware of all the new evidence which has emerged since the Anything Goes Period (roughly February 1985-mid January 1986) when he and his myrmidons had the argument all their own way? See also our review of Child of Change. ‘My attitude regarding the Karpov-Kasparov termination has been formed by what seem to be the facts of the matter, based on available documentation, and by a negative reaction to fanatical outbursts by people who clearly didn’t yet have enough information to be able to form a sensible opinion. What has been deplorable is that while it has been assumed that everything Kasparov said was true, it has been taken for granted that Karpov was not truthful when he said he wanted the match to go on. Kasparov is praised for what is considered to be his calculated method of winning the match by wearing out Karpov physically. If someone loses a match because he can’t continue, so be it. But why should anyone want a world champion who plays dull chess and who wins on the basis of physical condition, not an ability to play brilliant chess? Late January: Campomanes decided that he wanted the match to end after a set number of additional games. This was not because Karpov seemed to be in danger of losing the match, nor was it requested by the USSR Federation. Campomanes may have used health reasons as an excuse, but it seems clear that the most important reasons were financial, plus bad publicity for chess caused by too many short and boring draws. 30 January: Kasparov won game 47, making the score 5-2. 2 February, 1.30 a.m.: Campomanes met with Karpov and Mamedov (Kasparov’s representative). Campomanes proposed eight more games (after no. 47) and if the match was not decided by then, they would restart in September at 0-0 (24-game match). Karpov accepted. Mamedov refused. 2 February, 7.00 a.m.: Campomanes left the USSR. Kinzel continued to discuss the situation with Mamedov, who said he would talk about it with Kasparov. Kasparov then contacted Kinzel, refusing Campomanes’ s offer, except that he would play the September match at 0-0 only if the match were to be stopped immediately. 1-5 February: “Technical” time-out for negotiations. Kasparov protested, but he had not yet won two in a row. 6-7 February: Karpov took time-out. The BCM calls this an “illness break”. Each player was allowed six such breaks in the match. This was Karpov’s sixth regular time-out. 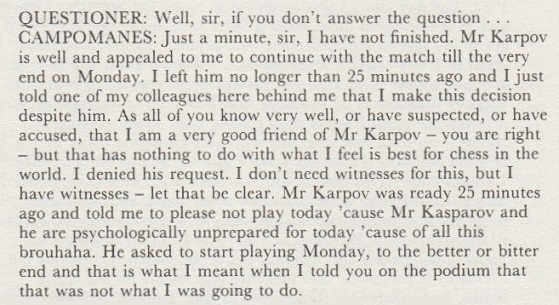 During this time he persisted in rejecting Kasparov’s request that the match be called off. 8-9 February: Kasparov won game 48. 11 February: Campomanes returned to Moscow. 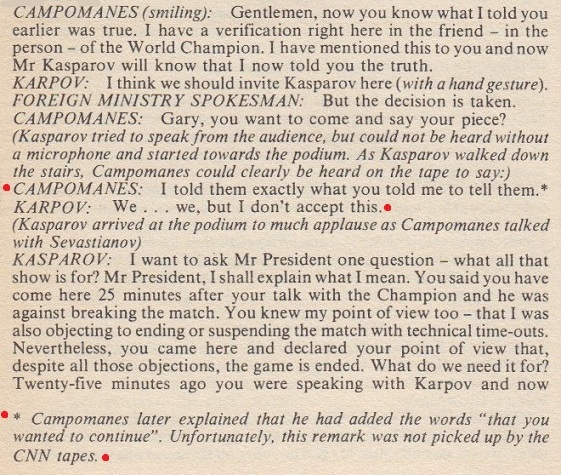 11-12 February: This is when game 49 should have been played, but Kasparov, who had apparently decided to use this time to convince Campomanes to accept his request to stop the match (or maybe to persuade him to let him withdraw that request...), took his sixth regular time-out. 13-14 February: “Technical” time-out – for negotiations, but it is said both players made demands that haven’t been disclosed. 15 February: The USSR Federation asked Campomanes to postpone play in the match for three months. That could very well have been a pro-Karpov move, but it does not go along with the allegations that the termination of the match was a pro-Karpov move that was wanted by either Karpov or the USSR Federation. The USSR proposal was not for a new match, but for a later continuation of the same match. The press conference. Karpov persisted, as he did later, in saying that he wanted to continue the match. Now Kasparov said so too. But after a private meeting with Campomanes, they agreed not to contest the termination, and to resume in September. 1) Karpov was always willing to continue the match, with or without a set number of additional games. 2) Kasparov was willing to continue only with an unlimited number of additional games. Termination was his idea, and his preference – at least between games 47 and 48. 3) Campomanes wanted to get the match finished fairly soon. Calling it off immediately was not his idea, but Kasparov put it into his head. There is no good reason (no evidence) to believe that immediate termination was for Karpov’s benefit, nor was it requested by Karpov or the USSR Federation. It is nonsense to allege that the termination was caused by Kasparov’s winning of two games in a row. Kasparov had requested it before he won game 48. 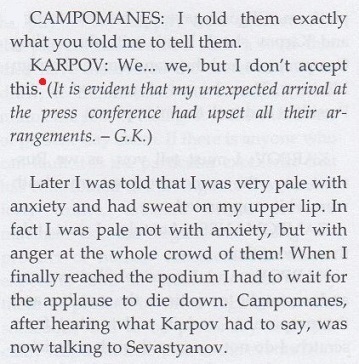 It may well be that he regretted, after winning game 48, that he had talked about termination, but Campomanes had no doubt come to like the idea, wanting to finish the match for plenty of reasons other than a very debatable benefit for Karpov. Option B: a cut-and-paste treatment based on his earlier unreliable accounts (as scrutinized in, for instance, our article on the Termination and in Kasparov’s Child of Change). It is Option B all the way. 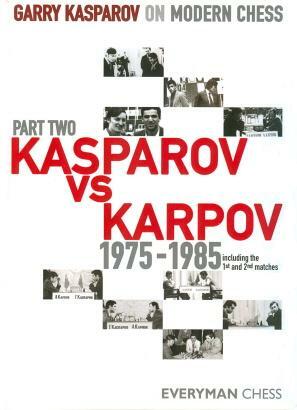 ‘... Karpov began to sit on his lead, just waiting for Kasparov to make a fatal slip. But the match was now into its fourth and fifth month, and Karpov’s strength was ebbing. Kasparov got back to 5-1, then Karpov suddenly lost two games in a row for 5-3 after 48 games. The match was becoming an embarrassment to the Soviet authorities, and play was transferred from the grand Hall of Columns to the Hotel Sport in the suburbs. No further information was offered regarding the claim in the footnote. What role may have been played by Dlugy (who was aged 19 at the time of the Termination) is unclear, but in any case the words ascribed to Campomanes are completely different. 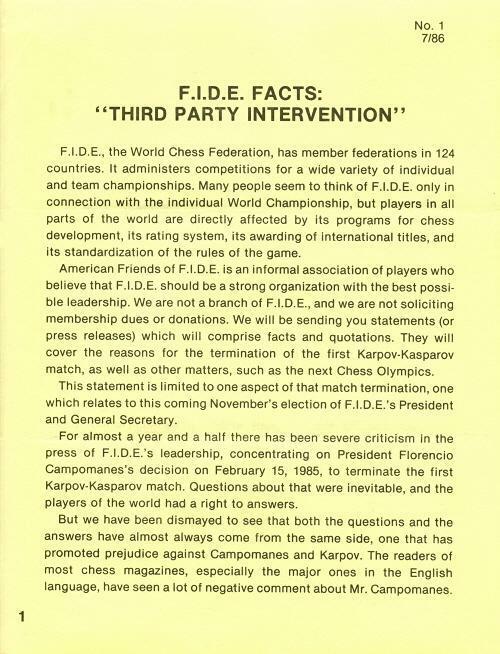 Instead of ‘I told them exactly what you told me to tell them’, we now have ‘But Anatoly, I told them just what you said’ (Campomanes page) and ‘But Anatoly, I told them what you said’ (FIDE page). It remains to be discovered why such discrepancies exist. As a test, let us now put the strongest possible pro-Kasparov construction on every aspect of the episode. 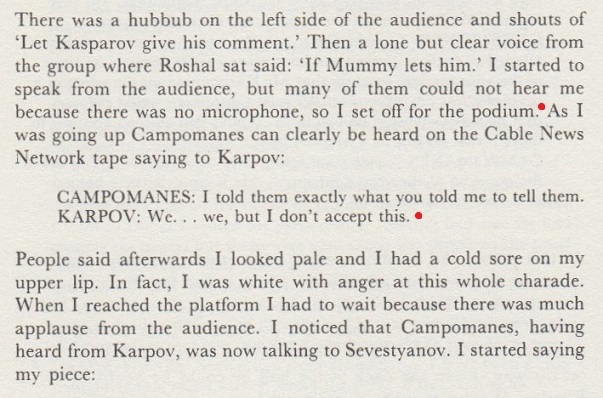 Let us assume, firstly, that although the hall was full and noisy, Keene and Goodman were wrong to state that Campomanes made his remark to Karpov ‘as Kasparov walked down the stairs’, and that in reality Kasparov was near enough to the podium to hear Campomanes’ quiet words for himself. 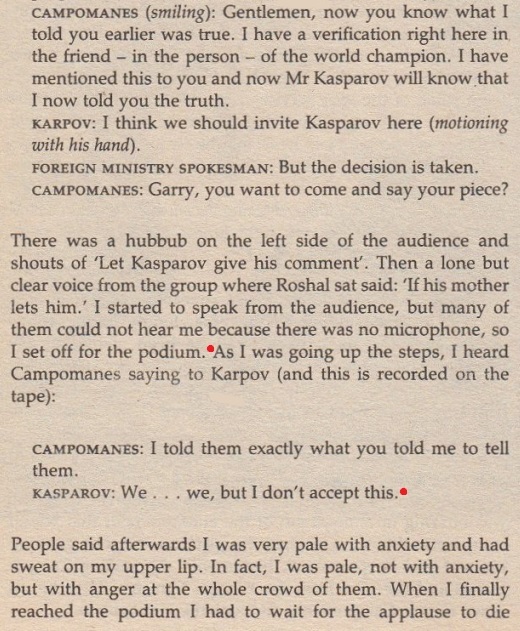 Next, let us assume that an audio and/or video recording still exists on which Campomanes can be heard saying to Karpov what Kasparov says that he heard (‘I told them exactly what you told me to tell them’), and/or one of the other versions (‘But Anatoly, I told them just what you said’ and ‘But Anatoly, I told them what you said’) and/or something at least vaguely similar. Let us go further still and imagine that Karpov himself now announces that he recalls the exact remark in question being made to him by the FIDE President. How, even after all that, would we be any further forward? For reasons of their own, writers have presented the words allegedly picked up on tape as highly significant, and as so damningly revelatory that no further explanation is needed. The very phrase ‘picked up on tape’ invites the reader to imagine that masks have slipped and that a smoking gun has been discovered. But why? 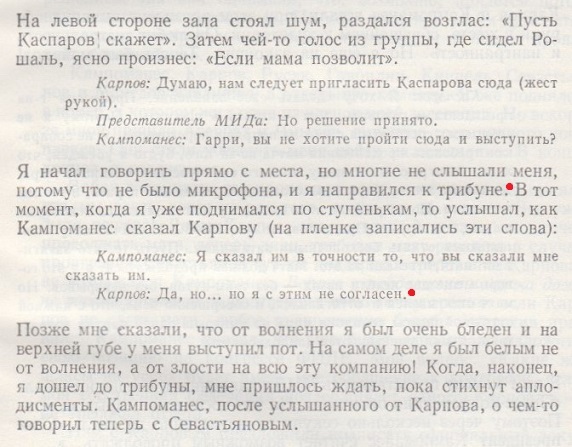 In the passages shown above (not one of which comes from a trustworthy source, it should be noted) all the versions of what Campomanes supposedly said to Karpov are open to so many interpretations (positive, neutral and negative) that no responsible writer would expect, or encourage, readers to draw one particular conclusion rather than another. Regardless of the rights and wrongs of the Termination Affair – and nobody can claim to know what happened in Moscow in February 1985 – the ‘picked up on tape’ matter is the dampest of squibs. ‘... FIDE halted a match with Kasparov to save an exhausted Karpov’s crown. ... FIDE president Campomanes was caught on CNN camera whispering to Karpov, “I told them exactly what you told me to tell them”’. Evans’ reply vaguely referred to alleged views on the Termination within Kasparov’s camp (i.e. that only Timoschenko wanted the match to continue after 48 games). Evans also commented that Kasparov’s ‘outrage’ over the Termination decision ‘may have been a case of crocodile tears’.